Use Google Analytics as a data source – How can we help you today? This article is divided into two parts. PART ONE will guide you through creating a data source using Google Analytics (Simple Mode). 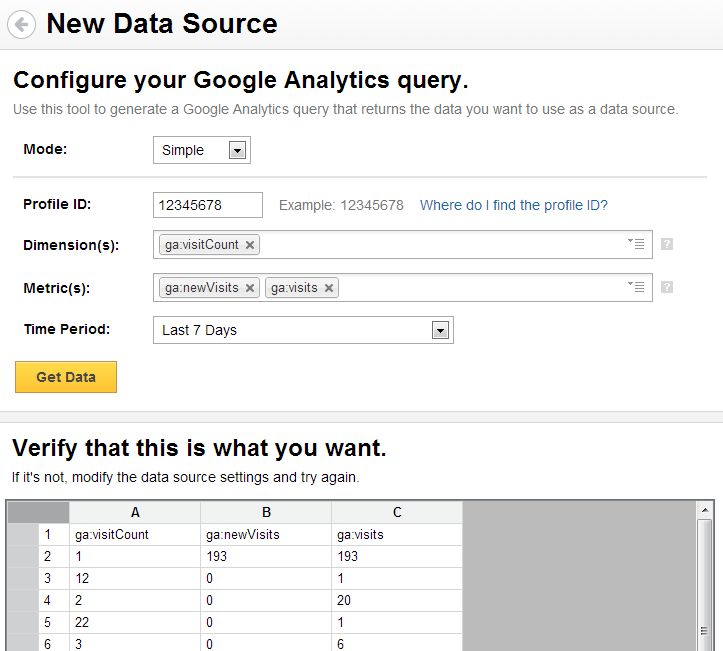 PART TWO will guide you through creating a data source using Google Analytics (Advanced Mode). Sample Query This is an example of a query URL you may see when using Advanced mode. Account For API access, ensure that you have Read and Analyze permissions. Simple Mode Simple mode provides an interface for crafting a RESTful URL that retrieves data from your Google Analytics account. Advanced Mode Advanced mode lets you craft a RESTful URL by hand or using the Google Analytics Graph API Query Explorer. This method is intended for advanced users with knowledge of Google Analytics API. (See below for more detailed instructions). 1. Switch from Simple mode to Advanced mode. Authenticate with Google Analytics using an OAuth Token. Select the Google Analytics option. Each web property in your Google Analytics account has a unique profile name and profile ID. In order to retrieve data from a specific web property/website, you need to enter that profile ID into Klipfolio. Sign in to your Google Analytics account: click here. On your account home page, select a website that you want to monitor. In the Reporter interface, copy the numerical ID after the p in the URL. Important: Do not include the letter p in the ID. Paste that ID into Klipfolio. With Simple Mode, you can craft a query using the drop-down menus provided. This method allows you to specify dimensions, metrics, and time period to be retrieved; if you want to retrieve data such as segments, or apply filters to your data, you should use Advanced Mode. Optional: Select one or more Dimensions from the menu provided. Select one or more Metrics from the menu provided. Select an appropriate Time Period from the menu provided. Klipfolio will return a spreadsheet with data from the specified fields. Authenticate using your Google Analytics credentials. In this section, you will work with the Google Analytics Data Feed Query Explorer to construct a URL. Click the Authenticate with Google Analytics button. Enter your credentials when prompted an click the Grant access button. Click on the words Click to list your accounts in the ids field. Select a website from the list of profile IDs you monitor. Click on the dropdown menu in the Metrics field. Select one or more Metrics to include in the API (for example: ga:visitors). Now you'll need to bring the query you crafted with the Query Explorer into Klipfolio. In the Google Query explorer, select the Query URI button near the top of the window. Paste the URL in the Query URI field using the Advanced Mode option. Many Klips that use Google Analytics data need a date range that is dynamic (for example, past 30 days). In this section we're going to change the query from a fixed range to a dynamic one. You can also link your Google Analytics account to your Adwords account in order to analyze web site traffic or sales driven by Adwords. Some useful metrics include impressions, click through rate, and ad costs. For more information, see Link Google Analytics and Adwords.